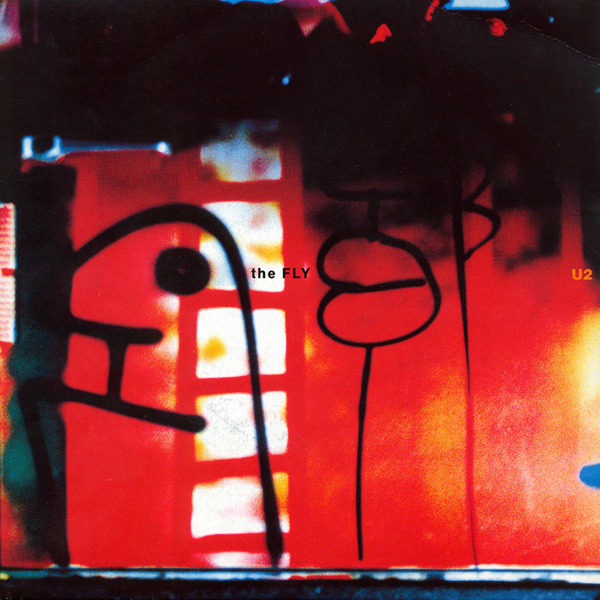 The Fly was the first single release from Achtung Baby and marked the arrival of a distinctive new sound and approach. Harnessing hip-hop and industrial beats and distorted vocals, Bono famously called the track 'the sound of four men chopping down The Joshua Tree.' The Fly flew to the top of mainstream charts around the world and became a huge alternative radio hit. The song and accompanying video also gave birth to the character of The Fly, the leather-clad, bug-eyed rock star who would join the band for the ZOO TV Tour. The song, said Rolling Stone, features 'grinding riffs that bounce off Adam Clayton's thick bass line and echo and embellish Larry Mullen Jr.'s drumming'. The critic in the New York Times said the track was an example of how it 'sounds as if [the band] has taken Bo Diddley and James Brown lessons for its new syncopated dance songs'. I will NEVER forget the night U2 played at the C.N.E in Toronto for the Zooropa tour..... 19 yrs old and their #1 fan (by my own calculations) I was STOKED to go see them and my boyfriend, friend and I set out for Toronto excited as anything to see Bono and the boys. Anyone who knows the Canadian Exhibition, knows they have a midway as well as the concert venue and I purposely avoided the midway and arrived in time to have a beer and attend the show. WELL..... on my way to the show we're passing the Polar Bear Express ride, which, goes very quickly backwards while playing loud music and what do I hear but "The Fly"......needless to say I begin shouting what I always say when I hear a U2 song...... "Hark, I hear angels....." and off we go to quickly purchase ride tickets and go on the ride. Well...... about halfway through the ridge the lighting falls down and BAM on my head and BAM on my arm and BAM on my head again..... They finally get the ride stopped and get the 3 of us off who had injuries (one injured worse then me and one not as bad). I was totally fine. In shock I think now that I look bad - slight concussion and a gaping hole in my arm where the jagged metal ripped into it. Again, totally fine UNTIL the medics said I would be travelling to the hospital for stitches and missing the concert! Then I totally lost my head. I wanted a bandaid and be left to attend the concert. I was horrified and inconsolable as I made my way to St. Michaels in the ambulance for stitches. I'll never forget hearing The Fly from the emergency room and thinking that I should be there. Don't worry too much about me - the park gave me floor seats to the show for the next evening and I proceeded to cry like a baby when the band took the stage and rip most of my stitches out through clapping and enjoying the concert the next night! What a song! What a night and a scar I look at fondly that reminds me of my absolute favourite band in the whole world......26 years and counting!! !